Low-profile clerk’s race marred by high-level friction in Salt Lake County. Could it cause hiccups in the election? 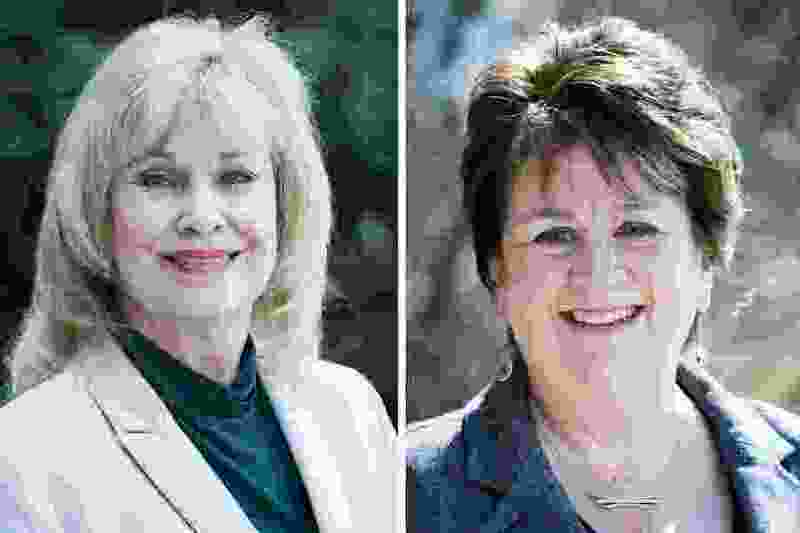 (Rick Egan | Tribune file photo) Sherrie Swensen (left) and Rozan Mitchell, who are running for Salt Lake County Clerk. Going into a busy election season, the Salt Lake County Clerk’s Office will have to manage without its elections director. Rozan Mitchell has taken an extended leave of absence. She says she decided to take the time off because longtime Clerk Sherrie Swensen had frozen her out of any decision-making and all responsibilities since Mitchell announced her plan to run for clerk last August. Calling the atmosphere in the office “toxic” and counterproductive, Mitchell, a Republican, took unpaid leave in mid-April but is now talking about it publicly for the first time in an interview with The Salt Lake Tribune. She worries whether what she describes as a kind of paralysis from indecision and lack of leadership will jeopardize the efficient operation of the June 26 primary and Nov. 6 general election. “You run some risk of it not being handled the way it should be,” she said. Swensen confirmed Mitchell’s absence but said it really isn’t a problem because the elections director had long ago stopped making much of any contribution to the office. The seven-term clerk, a Democrat, says the scaling back of Mitchell’s authority in the office had nothing to do with her election challenge of Swensen. Instead it was because of a new management-team approach to running the office adopted in the wake of 2016’s election disaster. That was when Salt Lake County voters, turning out to cast their ballots in person on Election Day rather than mailing them in, overwhelmed polling places and faced long lines — in some places two to three hours. She blames Mitchell for the mess that sparked outrage from the public and from state lawmakers, saying it was primarily due to the election director’s plan to have poll workers update information on provisional voters on the spot. Then, realizing that was causing long delays, instructing poll workers to instead look up provisional voters’ addresses on the county website, a process that can be tricky and time-consuming. Worst of all, she said, “I was never asked if that was OK. I was never informed that that was the plan. I would have never OK’d it. Instead, she said she sought to correct the misbehavior and mistakes by shaking up the management structure. Elections would now be overseen in a collaborative, management-team approach rather than being left up to a single person — the director. Mitchell refused to participate, Swensen said. “She took the approach that if she wasn’t in charge and didn’t make the decisions, that she wasn’t going to be a team player. “This had nothing to do with Rozan running for county clerk. Mitchell denies making unilateral decisions about the 2016 election and said too few voting centers and machines caused the long lines. Besides, she said, “the buck stops with Sherrie” — the elected official. Mitchell insists the bad blood was a direct result of her challenging her boss in the upcoming election. She acknowledged friction in the office in March. “In the first part of April, I had a conversation with my husband that I was miserable, and I have never been miserable going to work,” said the elections director, who has worked at the county for 13 years after six years at the state elections office. Mitchell said, in addition to her, there are four vacant positions, and she worries it could hurt the chances for a smooth election season. An example she points to is that forms were sent out last week for nonaffiliated voters to register with a party if they want to vote in the primary. Mitchell believes the mailings were sent too late and could cause complications with primary ballots going out June 4. Swensen says the party affiliation forms and upcoming primary ballot mailings are right on track. She also said temporary workers can be hired and trained in plenty of time for a fairly light primary, and the office will have a chance to staff up to handle the Nov. 6 general election. “This is going to work just fine,” she assured.